Anyone who has met Luther Burrell will recognise that he is someone who likes to make a good impression. His affable nature is popular among the media and with his team-mates, with the centre’s personality shining through, even when he suffered the agony of missing out on a place in England’s World Cup squad back in August. He is a people-pleaser and a player desperate to make his mark, for club and country. So it probably won’t come as much surprise to those who know him to discover one of the main reasons he feels he hasn’t quite hit top form this season. In fact, he has really tried. And he concurs with the opinion of Jim Mallinder, who feels the talented 28-year-old has perhaps been guilty of trying a bit too hard at times. With the Saints forwards dominating the majority of games, the backs have been left desperately trying to make their mark in difficult conditions. “Generally we haven’t had much ball and we do want to try to pull something out of the bag when really we should go back to being direct in getting our forwards around the corner, getting over the gainline and playing off quick ball,” Burrell admits. The likeable former Leeds lad is not one who likes to make excuses. He refused to dwell in a pool of self-pity when Sam Burgess and Henry Slade were surprisingly chosen ahead of him for the World Cup. But he does feel a couple of things have conspired against him this season. “I don’t think we’ve played one game this season where it’s not chucked it down with rain,” he says, smiling. “That suits our forwards but when you’ve got the likes of George North, Ben Foden, Tom Collins and Jamie Elliott, these flyers out wide, they’re never going to get the ball because it’s brutal. “That is a big factor. It’s not an excuse. “We train during the day and the weather’s normally okay, we’re on quick surfaces and everything’s sharp, but it’s just not quite gone that way for us. It’s not an excuse because we should be able to adapt and move the ball to space quite comfortably. And Burrell also adds: “For whatever reason, it’s not quite gone our way. “I’ve had three tries disallowed for whatever reason and we’ve had other tries disallowed. 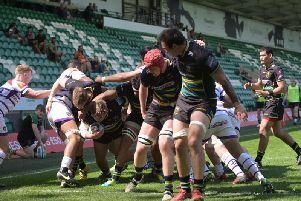 Burrell and the Saints midfield have been subjected to plenty of criticism from disillusioned supporters this season, especially at the Gardens. A few boos could be heard at half-time and full-time last Friday, as Wasps waltzed to a 24-11 win, which was built on an opening 30 minutes that saw the away side score three times. So aware of the reaction of others’, Burrell couldn’t hide his hurt at that display and reaction, even though he completely understood the frustration of the fans. “We were embarrassed because the last thing you want to do is disappoint the fans,” Burrell said. “As much as a group of players we’re disappointed with each other and how we’ve performed, people pay good money to come and watch us and we want to play well. “We haven’t gone out there to purposely play badly. We want to play well and make sure they feel like they’ve spent their money well. “When you perform like that for 40 minutes, it’s pretty embarrassing. Burrell is now desperate to help his team get out of the blocks quickly in what could be a season-defining game at The Stoop on Saturday. Sixth-placed Saints sit 10 points behind fourth-placed Harlequins, knowing a defeat this weekend would leave them with a mountain the size of Everest to scale. And Burrell, who had been part of England’s previous two Six Nations squads but didn’t make the cut this time round, said: “Hopefully the team can turn things around and we’ll get back to winning ways this weekend. “We need to push on during this period where the internationals are away because it’s important. “I know when I’ve been away before, you keep tabs on the group and there’s nothing better than knowing the lads back at the club are grafting away, pushing us up the league and getting the victories because it’s key. And Burrell knows that if Saints do well on the domestic front, their players will get recognition on the international stage. He may have suffered more knockbacks than a professional boxer in the past, but the Huddersfield-born star is still confident he can get back up off the canvas and land a few blows for England in future. “I spoke to (new England head coach) Eddie Jones, which is really good,” Burrell said. “He’s kept in touch with me after games, which is positive, and I’ve liked talking to him too. “I want to keep building on that relationship because it’s something I’m really passionate about and I want to represent my country. “Right at this moment in time, I don’t fit what he’s after so I just need to get back to playing well for Northampton, get back to my top levels and get on top of teams. “Hopefully I can catch his eye and push for summer tour and autumn internationals. “It’s a big year next year with Lions and the dream is still alive. And there is no doubt that Burrell, who has transformed from a Sale Sharks replacement to a regular Saints starter since his move to Northampton in 2012, will be putting in all the hard yards to get back there. “I’ve had a couple of errors in my game but I think I’ve been relatively solid,” he says when asked about his form. “It’s difficult to get behind the defensive line of the opposition in terms of my offloads and my line breaks, which are my strengths. “With the way that we’ve been performing recently, it’s not really gone how I would like. “Us as a backline want to perform, but we’ve got to stay positive. “I don’t think I’m making too many mistakes in the game. “Last week I threw a bit of a wobbler on a turnover ball but other than that I’ve been fairly consistent. “I just want the ball in a bit more space and between the coaches and us as a backline we’re trying to do that. “It’s not a negative thing for us. We’re still positive and we’ve got some class players in the team. “Competition’s healthy, we’re training hard and we’ve had a change of scenery in training, getting on a quicker surface so we can train with more intensity and tempo. Burrell is only too aware that others will expect more from him, too. And that recognition of his surroundings and what is needed from him can only be a good thing as he and Saints seek to get back on track at The Stoop this weekend.